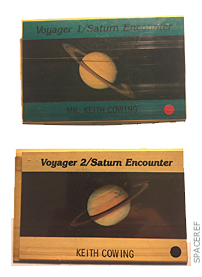 In 1977 the twin Voyager spacecraft left planet Earth bound for the outer reaches of our solar system - and beyond. What they discovered changed our way of thinking about how worlds are built and broadened our notions of where life might be found. The story of this audacious project is told in the captivating new documentary "The Farthest: Voyager In Space" which is airing on PBS this week. The film itself is weaved together rather artfully - not unlike the sounds and images that were placed on the now-famous "Golden Records" that each spacecraft carried. The story is narrated mostly by people who were there. Indeed its like listening to the crew of a ship of discovery recount the days of wonder that they experienced. Perhaps the best description of the project in the film - which has continued for decades - comes from Carolyn Porco: "Voyager to me was Homeric. 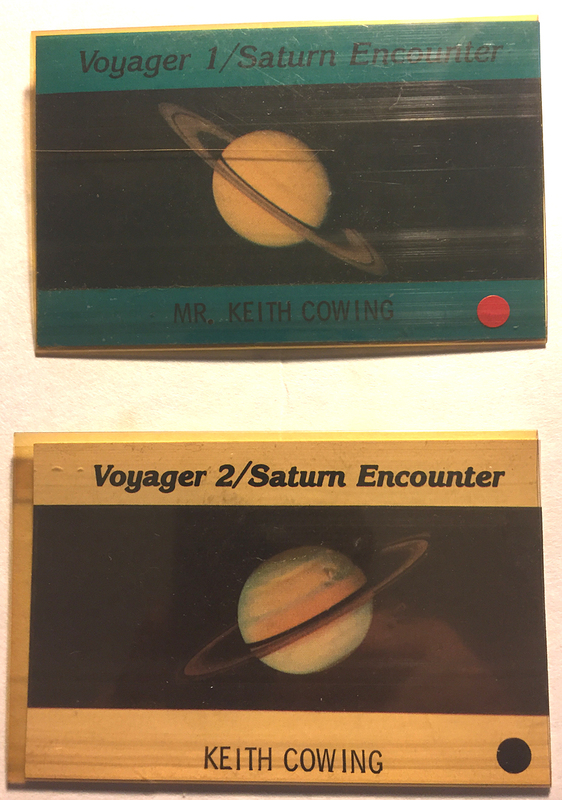 It was years of passing across the solar system from one planet to the other. And then it was a week or two of frenzied activity and discovery and conquest. And then it was, well, back in the boats, oars in the water, and on to the next conquest." This is a multigenerational story. If you were alive in the 70s and 80s then the fashions, the music, and the technology are familiar. Like everyone else with an interest in space, I find my own life punctuated and illustrated by Voyager. And as I watch the film my own life's timeline is played backward and forward. That the film provokes one to think about efforts that span more than a generation allows the viewer to better contemplate the true scope of this endeavor. In 1976 I visited the newly opened National Air and Space Museum in Washington, DC with its giant Voyager model. Along the walls were artist's concepts of what it might see and some hazy pictures taken by Pioneers 10 and 11. In 1977 as the Voyagers were being launched I was in college and still going to see the recently-released film "Star Wars" which was still in theaters. In 1979 I was back in the theaters again (multiple times) to see the new Star Trek film which had a cameo by a Voyager (VGER). In 1981 I was working in Los Angeles on Gov. Jerry Brown's political staff and found myself at JPL for both Voyager encounters with Saturn. In January 1986 as Voyager 1 flew past Uranus I was in grad school writing a letter to someone with an experiment aboard Space Shuttle Challenger. A few days later I wrote a letter to the President, NASA, and my member of Congress suggesting that the recently discovered moons of Uranus be named after the crew of Challenger (they weren't). In 1989 I was working at NASA Headquarters as Voyager 2 flew past Neptune. Shortly thereafter it began its "Interstellar" mission. As a NASA newbie seeing briefings with the word "interstellar" on them really set my imagination afire. In 1990 I recall the "family portrait" posters being hung around my office at NASA. In 2014 I was one of the co-leads on the ISEE-3 Reboot Project where we dragged NASA people out of retirement to tell a spacecraft launched months after the twin Voyagers to wake up and fire its engines. 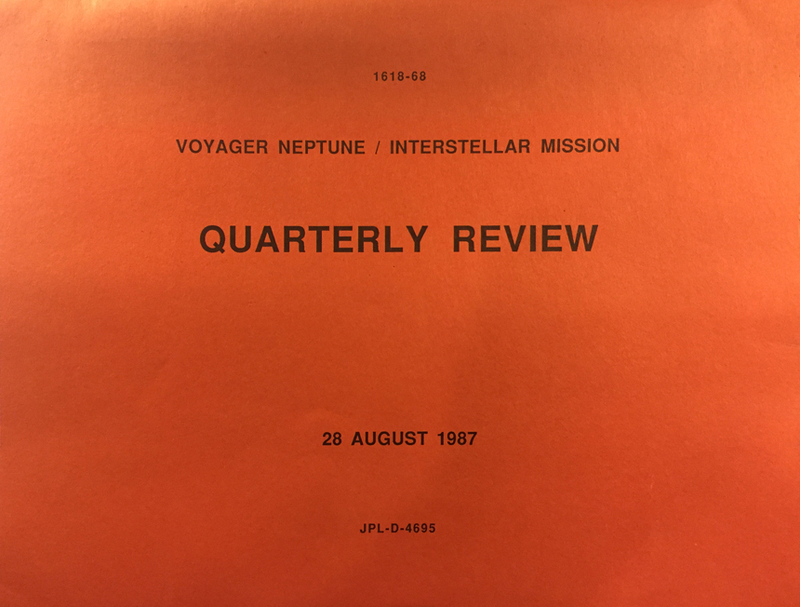 Our inspiration came in no small way from the ingenious way that JPL had managed to keep continuous contact with Voyagers and decades of planning and persistence by Bob Farquhar. The same Deep Space Network wizards who talk to the Voyagers were also instrumental in helping us talk to ISEE-3. As I tweeted about the project I made frequent jokes about ISEE-3, disco, and Star Trek's VGER (i.e. the Voyagers). The other night I went down to see (yet another) IMAX screening of the 2014 film "Interstellar" at the same Air and Space Museum I have been visiting for 40 years. I made a point of going to the Voyager exhibit. 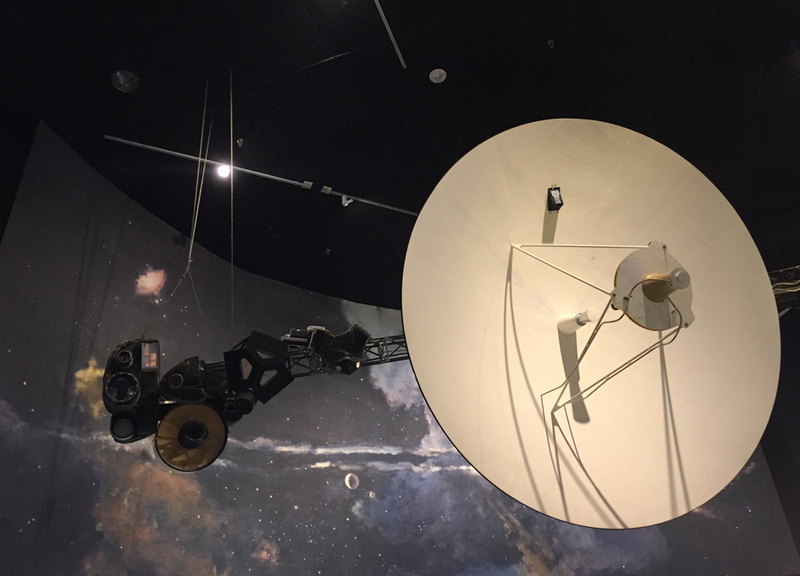 The exhibit is virtually untouched from its original 1970's form except that the artist's concepts have been replaced with Voyager photos - and those of its step children Galileo, Cassini, and New Horizons. The Voyager model still hangs there motionless as an avatar for the twin spacecraft that are moving out of our solar system into interstellar space. Voyager has been a talisman of sorts for me - always there just over my shoulder - filling in the artist's concepts of my youth with stunning actual imagery from afar. Several generations have now grown to maturity knowing only of the Voyagers' discoveries as facts. Indeed, it is hard to imagine a time when, as the film's participants often note, these fully realized worlds were just blurry dots in a telescope. As I noted before, the vintage footage and contemporary recollections by the Voyager project members in this film are what you'd expect from the naturalists and geographers aboard ships of discovery from the past - ships such as the HMS Challenger, the shuttle's namesake. As the Voyager veterans recall the excitement and disappointment, you can see the years melt away from their eyes. Then the years come back and their eyes fix on another more distant goal, often somewhat teary, as the enormity of their accomplishment registers once more. As noted in the opening of the film by Andrew Ingersoll, "It is really true that you can only explore the solar system for the first time - once. Voyager did that." Using technology that we would now consider to be woefully primitive these spacecraft truly blazed a trail into the unknown. Nothing we can do will stop these spacecraft from being our first emissaries to the stars. That die has been cast. We are now irrevocably an interstellar species. This film documents how this came to be. In 1977 the twin Voyager spacecraft left planet Earth bound for the outer reaches of our solar system - and beyond. What they discovered changed our way of thinking about how worlds are built and broadened our notions of where life might be found. The story of this audacious project is told in the captivating new documentary \"The Farthest: Voyager In Space\" which is airing on PBS this week.